In my last letter I said that I would comment more on the cost of Internet services here in Japan. You may remember that I pay 2,940 Yen, including taxes, for a server connection. This is about $27 and not expensive, by US standards, if it were to give me 24/7 connect time. However, it doesn't, the basic fee is for 130 hours! If I were to stay connected 24/7 as you can in the States then a month would cost me about $670 before taxes. That is 2,800 Yen basic fee plus 2 Yen a minute for everything over the basic 130 hours. But, that is not the end of it, you also pay for a local telephone call to your server that varies in cost depending on the time of day; my first bill averaged 200 Yen an hour. Therefore, to have a 24/7 connection in Iwaki I would pay about $2,000 plus tax per month. The Japanese government made a big issue of Information Technology at the G8 meeting in Okinawa in July. They carried on about how the gap between developed and under developed countries was being made even larger because IT isn't available to everyone. This is somewhat the same argument that liberals offer when talking about medical care; the poor can't afford the cost of high tech medicine. I can assure you that everyone in Japan cannot afford a 24/7 Internet connection and the Japanese government is doing everything they can to protect NTT from the competition that would make it possible. This is only a good example of what the Japanese government says versus what they do. The other good example is their position regarding the environment. They talk a good talk but we in the US have nothing to be ashamed of regarding our efforts compared to Japan. You wouldn't believe this from what you read in the papers or hear on the news would you. Why is that? My guess is that the media looks upon Japan as being the Socialist model for the US to follow and so everything is reported as being wonderful and we should emulate them. While I am on this general theme now may be the time to tell you about the electric service in Japan. I have told you that my air conditioner does not cool but that is only half of the story. Our apartment has 3 air conditioners and 2 of them work pretty good but if we have all three on at the same time we will trip the main circuit breaker if we turn on anything that draws a lot of current. Turning on a light doesn't do it but the washing machine will or a small toaster oven. Other Nova apartments have the same problem, or worse, so it is not just this location. In the winter we can only have two space heaters on at any one time; three will trip the breaker or two plus the toaster oven will do it. The high tech reputation that Japan has is a myth as far as I can see. If they cannot wire apartments with enough electrical circuits to operate what we think of as normal household appliances how are they going to bridge the digital divide? Most of my photos will also have electrical wires, poles or towers in them even though I try to find an angle that will avoid them. The reason for this is very simple; Japan has not yet discovered the concept of underground electrical service. They also take no pains to keep high voltage electrical towers off the ridgelines so the mountain views are despoiled when and if you can ever see them. I have asked my students about this and nobody seems to think that this is an environmental problem at all. Visual or sound pollutants are totally ignored here in Japan - the home of environmentalists that are quick to tell the rest of the world what they should be cleaning up. August is a hot time in the town of Iwaki and it is not just the weather I am talking about this time. On August 6th they began to set up decorations along 10 blocks of downtown. There is a bamboo pole foundation to all this - 30 foot pieces of bamboo including the short branches and leaves are lashed to electric poles and then support other decorations. 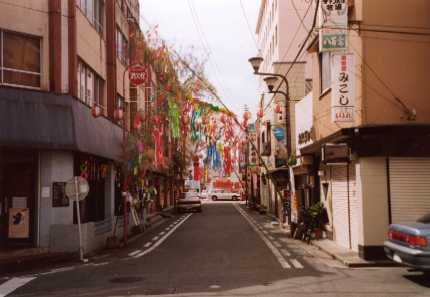 There are Tananata wishes written on pieces of paper and tied to the bamboo and then large pi単ata like things, made of paper or plastic streamers, are hung from the poles also. Very confusing to describe but I got some pictures that should help. 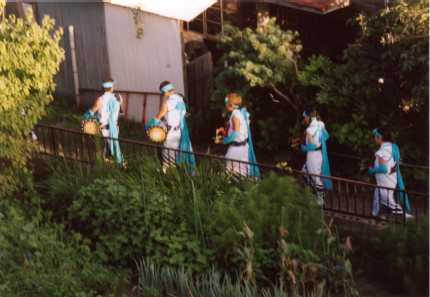 The event is called the Iwaki Tananata Matsuri and there are a number of Tananata held in this region; Sendi expected 2.2 million people to attend theirs. There isn't much to it from my point of view; a lot of food vendors and home craft vendors are set up on the street and that is about it. But, I am guessing it is very much like our county fairs in the States. People get to come to town and visit with people they see only at this time of the year, eat a lot of food, buy some stuff they would never buy at any other time, throw some money away on carnival type games, get drunk and have a good time. The event was on August 7th & 8th and I was downtown rather early on the 9th and everything was cleaned up! It was unbelievable. They were then setting up for the continuation of the festival which is an Iwaki Town Dance competition that goes on from around 1:00 in the afternoon to 10:00 at night. They set up loud speakers, I mean LOUD, and lights in each block for about 6 blocks of the main street and thousands of people dance in the street as groups compete for I don't know what. None of my students could really explain what is was all about except everybody has a good time. I think it is a chance to cash in on the increased crowds that have come to town and a sobering up day from the previous two; however, after the dancers stop I am not sure that really happens. The first picture on the left is one of the cross streets that is quite narrow and has only the decorated bamboo tied to the electric poles. 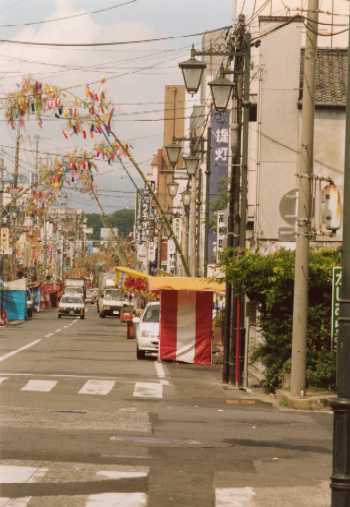 The center picture is of another cross street that has decorations as well as vendor booths. 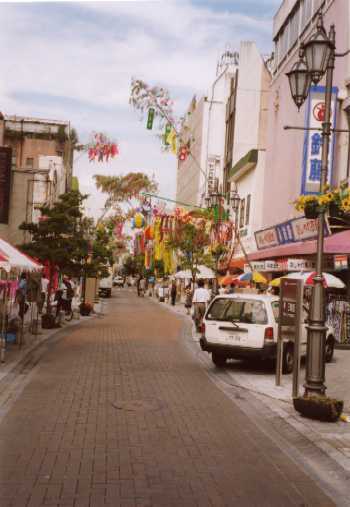 The far right picture is a street that is almost as wide as the Main Street and has had some 'urban development' enhancements done to it in recent years with some of downtown Taira's better shops. There were vendors set up along here also. The second picture on the left is looking toward the train station with the Nova office sign in the center left of the picture. You can also see some of the vendor sites here on the main street. Comment: I forgot to include a discussion of o-bon in this letter which occurred from August 13th to 15th. This is the time of the year when ancestral spirits are welcomed back home and the celebration also includes o-bon dances. During those three days I saw many small fires burning, or the remaining ashes, at the entrances of homes as I was walking to work. These small fires are to help guide the spirit to their home and family. 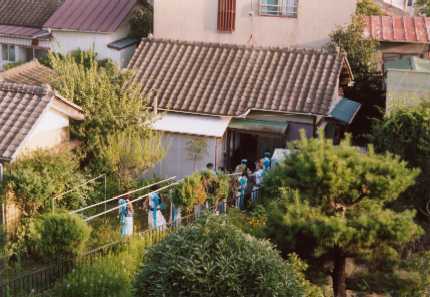 The Buddhist temple directly across the street from my bedroom window has been the o-ban band's practice site for about two weeks prior to o-ban. The band instruments seem to be drums and cymbals of two or three different sizes and after hearing them for the two weeks I can not say that they play more than one 'song' and I haven't detected any improvement or change in their playing. 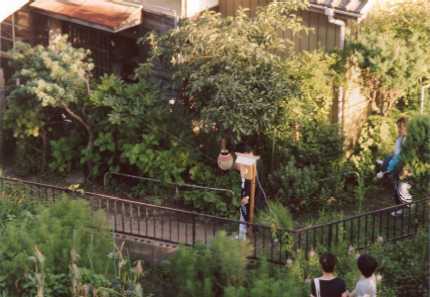 Here the 'band' and what I thought to be a priest are entering a house on opposite side of our apartment from the temple. My students told me that they visit homes that have experienced a death during the last year and prayers are said. There wasn't any 'band' playing while the priest was inside but they played while approaching and before entering. The 'band' waiting for the priest and 2-3 assistants to come back out. I'm not sure what this lone trailing member was doing; didn't have any instrument and didn't go inside. I went to Sendi (the largest city in Tohoku, northern Honshu, with a population of about a million) on August 25th to get a re-entry stamp for my Japanese visa. I currently have a 3-year working visa but if I were to leave Japan without the re-entry stamp then the visa would no longer be valid. I'm not thinking of staying here past my one year contract but I am planning on going to Viet Nam in January for a bike tour and needed the re-entry to get back into Japan after the trip. They offer a one-time re-entry or multiple so for the difference in price I got a multiple and now have a visa with multi re-entry ability for the next 2 and half years. That plus a great lunch was the up side of the day trip! I had lunch at an Italian place that offered a lunch special of: unlimited drinks, soup, pizza and bread plus a salad, large serving of pasta and a small salmon fillet with 4 small shrimps - this was 1,000 Yen, a real bargain by Taira standards. Everyone in Taira goes to Tokyo or Sendi for their serious shopping and to go to some "good" eating-places. The down side was that I caught the train at 6:22 am for the 3 hour 150 Km ride to Sendi and managed to get the 1:15 pm train back; train cost 5,000 Yen or almost $50. The other downer was the weather once again; it was extremely humid with so much water in the air that visibility was cut to maybe 5 Km. I saw a lot of rice fields and vegetable patches but the mountain views were either totally obscured behind a veil of water or just the ridge outlines were visible. The early morning trip was not too bad but the afternoon return was very uncomfortable because of the temperature, humidity and inadequate air conditioning on the train. 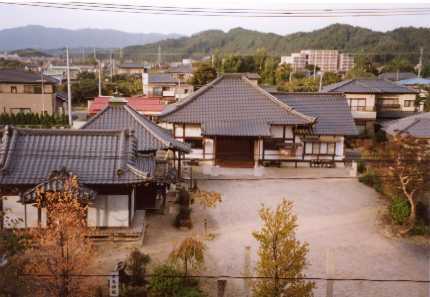 I had no interest in staying in Sendi any longer than it took for lunch but I am planning to go back through there in November for a sightseeing trip to northern Honshu. More about that in future letters.